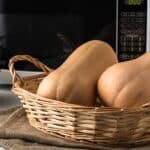 One of the quickest ways to cook butternut squash is in the microwave. It makes cutting, peeling and dicing the raw squash a thing of the past. Here we are again with one of my favorite winter squashes. The butternut squash. Based on the popularity of some of the butternut squash posts on the blog like this one that shows how to roast a whole butternut squash or this creamy soup recipe you’re a fan as well. And since you’re a fan, I thought you might enjoy this post about summer squash. Now, I have heard complaints about the difficulty in cutting and peeling squash, and I will be honest, I have voiced the same complaints. Well, you can stop using those reasons not to cook with butternut squash because I have a very simple solution for both of the issues. Your microwave. Yep, you can cook the whole squash in the microwave. No peeling, cutting or dicing before cooking. Simply make some slits in the skin, place it on a microwavable plate, set the timer and watch it spin its way to a perfectly cooked veggie that is easy to peel, cut, and dice. One very important step is to make slits in the skin. This allows steam to escape. Don’t skip this step. I used a sharp paring knife. I think it is much easier than trying to chase the squash around the counter as I’m trying to poke holes through the skin with a fork. If you have perfected that craft, then use it. I’m going to stick with the paring knife. The cooking time is dependent on the size of the squash. For the 3 pound squash that I used, it was 12 minutes. I did start checking it at 10 minutes and then continued to cook it checking at 1-minute intervals. When the paring knife sunk easily into the flesh, I knew it was done. Make sure that you let the squash cool before you handle it. You can slice it lengthwise, remove the seeds, and scoop out the flesh. Or peel the whole squash with a vegetable peeler or paring knife, cut it lengthwise, remove the seeds, and dice it up and use it in a salad like this one that has orzo and blue cheese which I adore. Using a sharp paring knife, make several slits around the squash. This will allow steam to escape. 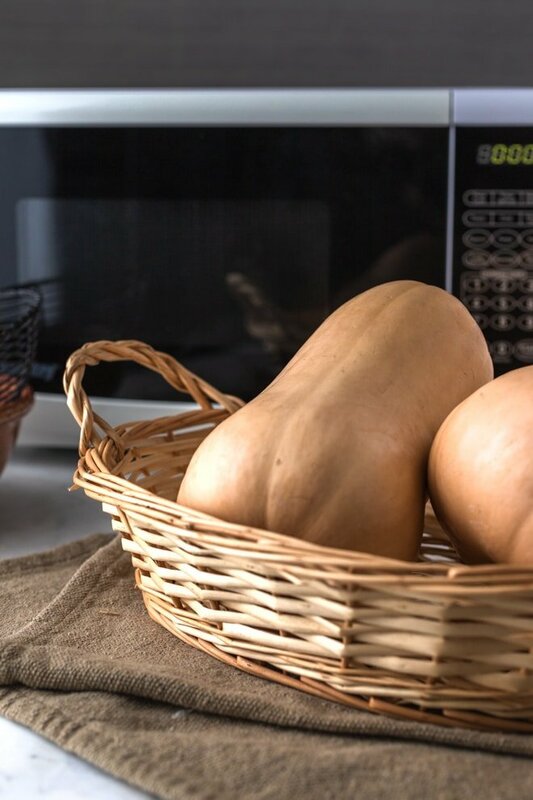 Place the squash on a microwave-safe dish and place in the microwave. Microwave on high for 10 – 12 minutes. Remove the squash carefully and allow to cool enough to handle. Cut the squash in half lengthwise and remove seeds and scoop the flesh from the skin. Alternatively, remove the skin from the flesh with a vegetable peeler or paring knife, cut in half lengthwise and dice.